Smart and compact, the RS560 VHF single channel receiver is a cost-efficient solution for frequency monitoring in air traffic control applications. When integrated in a 19″ sub-rack, 8 receiver modules can be installed side-by-side to optimize space and cost. The Becker RS560 Single Channel VHF Receiver is designed to be integrated in system racks installed in air traffic control centers, airports and and airline company offices. The RS560 is fully microprocessor controlled which allows remote operation and monitoring. 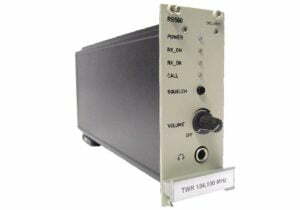 Frequency selection is made by PC or via the remote control interface. Due to the small size of the RS560 (3HU), only minor rack space is required for each unit, thereby allowing the installation of up to eight (8) RS560 receivers in one 19″ rack drawer. All control parameters like squelch on/off and muting are available via the front panel. LEDs show the current operation status of the receiver providing quick and easy supervision. The socket for headphones and the volume control is also supported via the front panel. Technical features like selectable 25/8.33 kHz channel spacing make the RS560 a well-suited solution for your airport communication system.